"I'll bring all my Roy Orbison tapes." Nice. We generally keep things light here at Tinsel and Rot, but sometimes something comes along that's a little on the darker side. And it doesn't get much darker than what happened three doors away from me Tuesday morning. Let me first start by saying that I'm the type of guy who gets sentimental for the people that sell me my newspapers in the morning. I can remember the guys at the Optimo in Staten Island who sold me my papers every morning on the way to high school (and my wrestling magazines before I graduated to newspapers) and called me "Chief." I was always fond of George, the raspy-voiced guy at Mac's at Ithaca College, where I stopped every morning (or, in the later years, after I discovered no real need to take classes in the morning, every afternoon) for my papers. And I recently had a crisis when the woman who sold newspapers outside the Pavonia/Newport PATH, and had my Post and Daily News ready for me every morning, suddenly disappeared and I had to adjust to a new guy, who lost my business when he chased me into the PATH station because I had given him a dollar bill with a tiny corner piece missing. I'm trying to warm up to a newsstand near the station, but it's not feeling quite right yet. All that is to say that I have a great fondness for those who sell me my newspapers. And that includes the family at the bodega on my street, where I routinely stop for my weekend papers, assuming I can rouse myself to put on pants before the papers sell out (I don't buy the daily papers there because they don't get the Sports Final). They're always very pleasant and friendly, and the patriarch of the family always had a kind word as I went on my way or even if I saw him closing up shop at night. I'm certain I never had a real conversation with him, but still, I felt a certain kinship, because I like the people that sell me my newspapers. That guy at the bodega, whose name was Kiritkumar Parikh, was killed Tuesday morning by some heartless douchebag in a botched robbery attempt at the store. That bodega where I bought my newspaper was on the cover of one today, and that family is now without their father. When I walked past the shrine that is now outside the bodega tonight, I almost lost it. Not because someone was murdered three doors down and about 90 minutes after I passed by (though, truth be told, I'm not feeling all that great about that), but because Mr. Parikh is gone. Just gone. For no reason. And I'll never again see him on a Saturday morning, or heading home for the night. It doesn't seem right, or even possible. All because of a creep and his gun. Requiescat in pace, Mr. Parikh. And if you're so inclined, faithful reader, say a prayer today for Mr. Parikh's family. So far, 2009 has brought much exciting news. *I've discovered a nearby bowling alley that offers $2 games on Sunday mornings (and it's right next to a diner...and across the street from the Acme where Randy the Ram worked in "The Wrestler"). *I've found out that the Newark Bears not only will not be forced to fold, but will come back with former White Sox catcher and Tinsel and Rot All-Star Ron Karkovice as their hitting coach (for some reason, my friend Brian and I selected him as our favorite player in the late 1980s/early 1990s; it may have been his albinoesque appearance). And to think I almost threw out my "Officer Karkovice" t-shirt. *The multitalented (and, OK, quite attractive) Amy LaVere is soon to star in an MTV Web series called "$5 Cover" that looks like it might be both good and good for her. And she'll be on "Late Night with Conan O'Brien" next Monday, too. But perhaps the most exciting news came the other day when I got an e-mail from Shout! Factory touting the March 17 release of another TGIF staple, the criminally underappreciated "Mr. Belvedere." Yes, Uecker lovers of America, your prayers have been answered (or at least your Belvederian prayers; I can offer no good news on the "Wacky World of Sports" boxed set front). I think it's a great shortcoming of TV Land that there isn't more variety on the station. Look, we all love "The Cosby Show," but enough already. There were a lot of other great shows on TV in the 1980s. With over 100 hours to fill, you think you could dig a little deeper. Fortunately, come March 17, we Fans of Brocktoon no longer have to wait for TV Land to wake up. 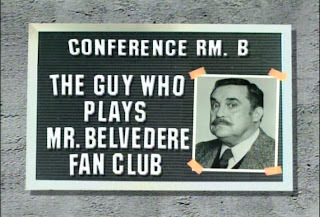 We will have the first two seasons of "Mr. Belvedere" right at our fingertips. Let us rejoice. JT: Satan is Real is hands down the best album cover in music history. Can you tell me a little bit about the process of creating it? Charlie Louvin: After the song was finished, it hadn’t been released yet. 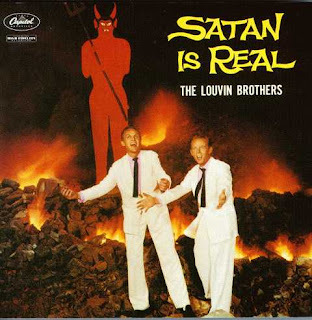 They wanted to put out an album, and we asked if we could make Satan is Real the album title. We got the okay on that. My and Betty’s oldest son had a Lionel train on a four by eight foot piece of plywood. At the time, money was scarce, so we removed the train from the plywood, cut it in two and made Satan sixteen feet tall. We pictured Satan as having a pitchfork and horns; that’s what we were told when we were kids, but I find that it’s not true: I’m pretty sure I saw Satan the other day in a bikini on the beach. My reasoning went something like this: If I'm gonna live a life where I take a Greyhound from New York to Charlotte for a wrestling convention, wait on line for two hours to get a picture with Corey Haim, and head out in a vicious rainstorm to see Dustin Diamond do stand-up, then I'm gonna need a really good reason why I shouldn't attend the inauguration of Barack Obama. Distance wasn't really a factor, since D.C. was only about four-and-a-half hours away. The weather? Well, yeah, that would be rough. But I spent my college years in a city where a walk from one end of the campus to the other could leave you crying as the winds pried open every tear duct you had. So I was prepared for that and was well-versed in the art of layering. So, knowing full well what I was getting into, and with a place to crash Monday night (thanks, Ellis family! ), there was in fact no good reason not to bear witness to one of the more historic days in the nation's history. Even though, much like my good buddy Alan Jackson, I'm not a real political guy, I'd been to Clinton's first inauguration, with a bus full of guys in high school I didn't like (one of whom put a battery in my mouth when I fell asleep on the bus), and had memories of how cool that was (despite getting lost afterward). I had the feeling Obama's day, and being among the potential millions of deliriously overjoyed on the Mall, might be a touch cooler. That's how I got to Washington. * The thunderous sound of millions of gloved hands clapping during pauses in Obama's address is a sound I will never forget. * If you're going to stand in sub-freezing cold for five hours, you oughta do it with one million people whose sheer collective joy will get you through those moments when you can't feel your toes and your right leg starts shaking involuntarily. * You should see the sun rise behind the Washington Monument. It's kinda cool. * It's also cool to walk through the I-395 tunnel. * Even after spending five hours essentially in the same spot, even after bobbing and weaving through the mobs exiting from the Mall, even after standing amid hundreds of disgruntled mass transit users waiting to be let into Union Station (and getting in with about ten minutes to spare before our train headed out of town), I have no problem saying that there is no place I would have rather been on January 20, 2009, than on the Mall, watching America take a firm, confident step forward. As I was figuring out all the transit particulars last week and making sure we had a solid plan about where we were going and when, my mind wandered to thoughts of my friends' kids and how, when they grow up, it won't be a strange idea that an African American can be president. There won't be discussions about whether certain groups would let that happen. Because it did happen. The doubts of the past have been erased. And I was there when that officially changed. Pretty cool. Good luck, Mr. President. And thanks for the party. Let this be a lesson, future bootleg t-shirt makers: Even in the new America, you're still gonna need to know how to spell. Tinsel and Rot aims to stay fresh. So, look for a few new features to be introduced here on the blog in 2009, the first of which is Revku. What's Revku, you ask? Good question. It's my attempt to review some (I'd like to promise all, but who can guarantee poetic inspiration?) of the shows I go to using a variation of the Japanese haiku format (we're sticking with the five-seven-five structure but dropping the obligatory tie-in to the weather, though we inadvertently nail that on the first one). Each concert revku will also feature a photo I took at the show.